A false-color image of a sub-region of the survey field that discovered missing galaxies. The under-luminous Lyman-alpha image is shown in blue, green shows visible light, and red shows the infra-red observation. The United States wants everyone to stand up and be countedin the 2010 census, but meanwhile many galaxies have been undercounted in theirown celestial census. It turns out that about 90 percent of distant galaxies donot show up in a commonly used galaxysurvey method, a new study has found. 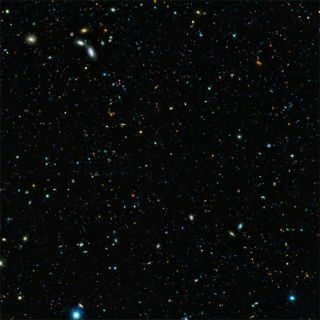 "If there are 10 galaxies seen, there could be ahundred there," said study leader Matthew Hayes of the Observatory of theUniversity of Geneva in Switzerland. A common way to search for galaxies is to look for a thinrange of light emitted by hydrogen within the galaxies called the Lyman-alphaline. Scientists have suggested that some of the Lyman-alpha light never makesit to our telescopes on Earth because it is absorbed by gas and dust within thedistant galaxies themselves. To test this idea, researchers conducted an extensive surveyof far-off galaxies about 10billion light-years from Earth. First, they looked for galaxies thatemitted Lyman-alpha light. Then they looked at the same patch of sky through afilter that only let in another wavelength range called the H-alpha line, whichis also emitted by glowing hydrogen. The astronomers found that many of the galaxies apparent inH-alpha light were completely dark in the Lyman-alpha line, and would have beenmissed in a survey that only observed in Lyman-alpha light. "Astronomers always knew they were missing some fractionof the galaxies in Lyman-alpha surveys, but for the first time we now have ameasurement," Hayes said. "The number of missed galaxies issubstantial." The observations were made with the FORS and HAWK-I camerason the European Southern Observatory's VeryLarge Telescope in Chile. The researchers detail their findings in theMarch 25 issue of the journal Nature. While Lyman-alpha light is still a useful way of hunting forgalaxies, the new findings help put these surveys in context. "Now that we know how much light we?ve been missing, wecan start to create far more accurate representations of the cosmos,understanding better how quickly stars have formed at different times in thelife of the Universe," said co-author Miguel Mas-Hesse of the Centro deAstrobiologia (CSIC-INTA) in Madrid, Spain.